Sea turtles are one of the most ancient creatures that are still living on this planet. But since a few decades, their population is shrinking very fast, due to takings of their eggs and illegal nets. We are dedicated to sea turtle breeding, to rescue the vanishing sea turtle population in the seas worldwide. Sea turtles are usually reaching an age of 60 to 80 years. The species we are breeding here are Green Turtle (Chelonia Mydas) and the Hawksbill Turtle (Eretmochelys Imbricata). Both of these species belong to the most endangered sea turtle species worldwide (there are 7 species in total still living on this planet). Sea turtles roam all the seas worldwide (except the pole areas), and usually come back to the beach were they were born to lay eggs when they reach the age of 30 to 40 years. After that reproduction happens every 3 or 4 years in the months after the raining season. 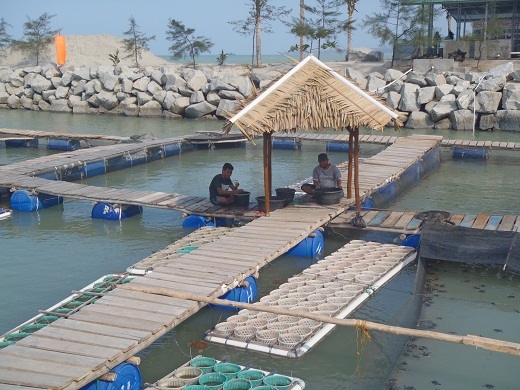 In the past in Indonesia the use of sea turtle eggs was strictly regulated and limited, but in the recent decades (since colonialisation) the quotas were far too high for being sustainable, and sea turtle eggs were also taken illegally. Therefore we think protecting the beaches is not enough and in highly populated areas not possible, it needs actively helping the sea turtles to survive the beginning of their life, because naturally only 1 sea turtle within 1000 will reach the age of 8 years, when they are old enough to lay eggs. You are welcome to visit us and see our work yourself. You can also join the sea turtle release, which happens about once a month. We are open for visitors from 8:30 AM until 6:00 PM.